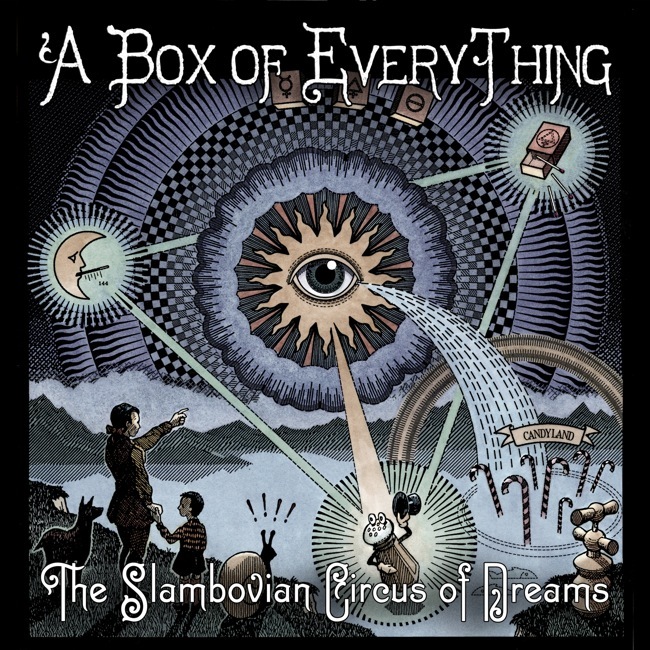 The Grand Slambovians (AKA The Slambovian Circus of Dreams) return with “A Box of Everything,” their first release on Sony/Red River Entertainment. The 14 track album is a remastered, catch-up on what you missed, compilation that includes new 3 tracks. It’s all new to me and I’m really glad to have made it’s acquaintance. Formed in Sleepy Hollow, New York (why am I not surprised) in the late 1990’s, The Slambovians are a ragamuffin band that reminds me of expanding/contracting familial collectives like Daevid Allen’s Gong. The festival circuit in the US and UK has been their stomping grounds and they’ve built a grass roots following of fans and friends and extraterrestrial hillbilly pirates. The first track to catch my attention for repeated play was the slide guitar driven party of a tune with the smile inducing title “Trans-Slambovian Bi-Polar Express.” No it’s not about former members of Savatage moving to Sevastopol. Based on current trends this tune, with it’s railroad metaphor, melodic lead guitar work, and rollicking drum pattern, could easily be as at home on the Country Music Charts as it will certainly be in rotation on college and Americana friendly stations. The richly layered production by guitarist Sharkey McEwen and “the circus” perfectly accentuates the band’s multi-instrument nature and continues to reveal little sonic gems on repeat listens. While clearly aware of and well versed in musical styles that came before them, The Grand Slambovians also have an iconoclastic side that allows for cheeky recombinant experiments. New track “A Very Unusual Head” is a Bowiesque British Music Hall ditty that appears to be a rumination on the autopsy of Joseph Merrick, The Elephant Man. For mix-tape makers, any of “A Box of Everything” will fit nicely in playlists with the newest Ghost of a Saber Tooth Tiger, Old School Robyn Hitchcock/Soft Boys, Blackfield, The Waterboys, World Party, or their progenitors Syd Barrett, Pink Floyd, psychedelic era Beatles and Stones, and (you guessed it) Rolling Thunder Revue era Dylan. Wow this is a really solid track and it sounds like something I would enjoy an evening of. This could make for a fun adventure on behalf of music.